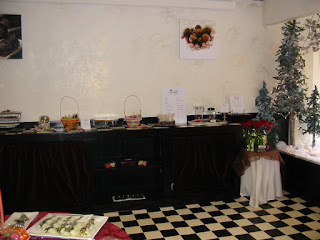 The second chocolate shop I found just really a chocolate shop unlike Harry & David's which sells a wide range of foods. 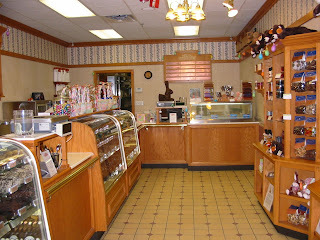 This was the Rocky Mountain Chocolate Factory outlet in the Tanger Outlet Center in Williamsburg, Iowa. As you can see in the photo to the left it was night time when we visited this outlet mall and this shop is located at the end of the eastern side of the back strip of stores. The nice lady there the only shop keeper on our Spring trip that didn't feel she had the power to make an offering to The Chocolate Cult so they are only getting this basic product review for the four items I bought. To the right you see the entrance to the store from insie of it and some of the displays along the side -- it was a narrow but long layout so not too many folks could comfortably fit in at once there. I bought two varieties of their "Sea Foam" candy which I was told is like their version of honey comb candy which I know I've reviewed at least once from the Pilgrimage to Nashville last fall with the Chocolate Coconut Acolyte. These are huge pieces, 2.5 X 1.75 X 0.5 inches in dimensions. 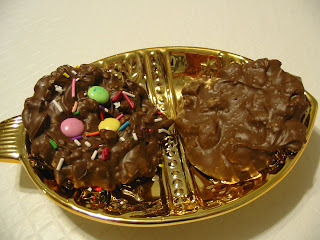 One is covered in milk chocolate and the other in dark chocolate as you can see in the photo to the left. The milk chocolate has a sweet scent while the darker is only the chocolate. Both are very crunchy and have a multi-layered sweet, hard center that has a strip of honey between two lighter but crisp layers. The milk chocolate adds to the sweetness while the bitter dark chocolate helps counter it well. Personally I prefer the darker but it will be a matter of your taste. 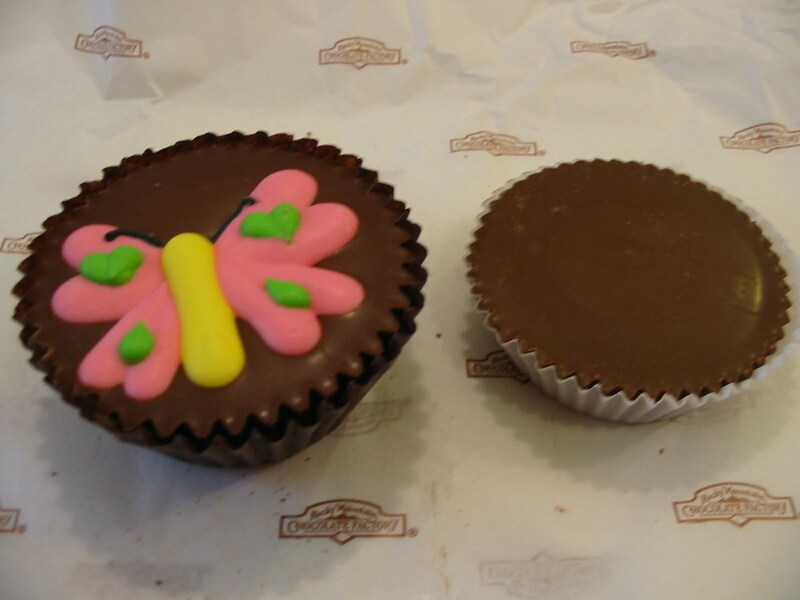 The two peanut butter cups I got were both milk chocolate but one, the larger one with the butterfly in sugar frosting is the regular while the smaller one is sugar free. The regular measures 2 inches across on the base and is 1.25 inches deep while the sugar free is almost 2 inches across the base but rises to only 0.75 inches tall which makes it feel like perhaps 60% of the weight of the regular. And yet it costs more which is sadly not uncommon for sugar free products. Why is it that things which are supposed to be better for us or for specialized diets get away with costing more? As a historian, your Chocolate Priestess knows this was not always the case because fatty and more rich foods, less healthy ones, used to be only within ready reach of the wealthy who in turn suffered illnesses we now associate with poverty and inexpensive foods. Enough of my complaining, how do they compare in terms of our senses? The sugar decoration really covers up the chocolate for the regular cup until I peel back the wrapper to sniff the side but the milk chocolate is very evident to my nose for the sugar free. The sugar free has a very thick shell of chocolate with a semi-sweet peanut butter center that doesn't have the sad sugar free yuck you can easily find in mass produced and readily available products you can find in most stores these days. Since I don't know what if anything has been substituted for sugar be wary of eating this quickly since most of those substitutions have affects on your digestive system. The regular peanut butter cup is hard to cut a piece from because of it's size but I don't think I want to open my mouth wide enough to take a bite directly from it. This is actually two layers of peanut butter filling and three layers of chocolate when I cut off a piece. It tastes much creamier and sweeter than the sugar free which isn't so surprising. I actually think the chocolate itself is a stronger flavor in the sugar free variety. As you can see, I was seriously limited by my budget in terms of what I could try here but there are dozens and dozens of varieties of chocolates, cookies, ice cream, drinks, and candies just in this one store. I wish the store manager had been able to make us an offering but perhaps in the future they will send us something else so we can feature them on a Saturday Sacrament. Sisters and Brothers, may you, too, take the time to slowly appreciate what the Divine and human ingenuity have offered you in chocolate. You've heard of Reese's Pieces, I'm sure, Sisters and Brothers. You've heard of Hershey's Special Dark chocolate bars. 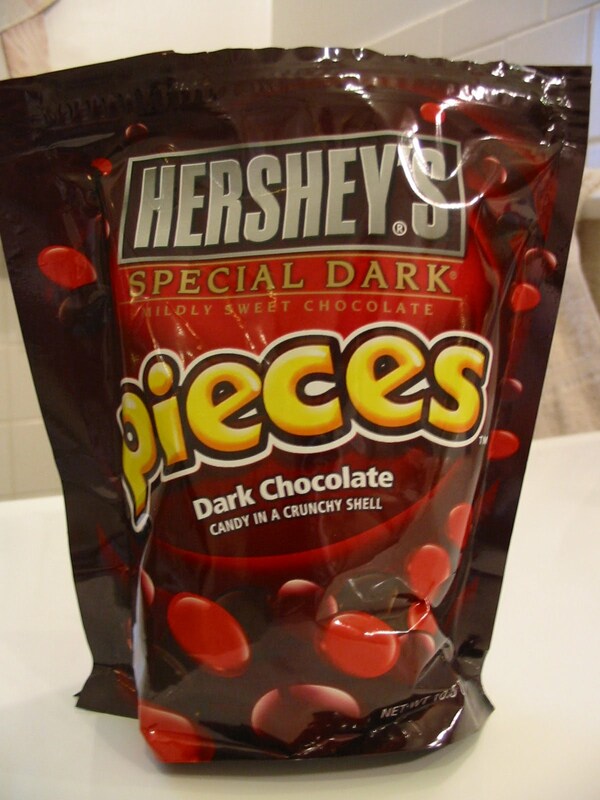 Now you can get a bit of both as one of the new line of "pieces" candies from Hershey's. I bought this with a coupon and when it was on sale. I happen to like the Hershey's Special Dark bars though not as much as specialty dark chocolates I find it a solid choice that you can find readily in most grocery and discount stores around the USA. Just because I like the candy bar though does not mean I will like it when it is covered in a candy shell. So let's see if your Chocolate Priestess was as pleased with this option as she can be with the simple candy bar. These pieces, approximately 350 or seven servings of .5 inch diameter candy pieces, are covered in three colors: black, maroon, and red. One serving has 180 calories, 5g saturated fat, 10mg sodium, 2g fiber, 26g sugars, 1g protein with 8% iron. The very first ingredient on the label is sugar followed by chocolate. It tastes like sugar is the primary ingredient. Oh, it has that darkness there, a hint of the bitterness but a lot of sugar as well. I didn't note a difference in flavor between the color by the way so I can't blame the dye for the sweetness. With Reese's Pieces I expect the sweetness that peanut butter can have, that isn't what I want from my Special Dark bar. If you've never had that candy bar, you might enjoy this more and then find it too bitter but for me, I'll go with the bar over these pieces any time. I want to see a show of hands, or comments, Sisters and Brothers. How many of you have had a Milky Way candy bar from Mars? You know the "rich chocolate, creamy caramel, smooth nougat" on the label Milky Way. 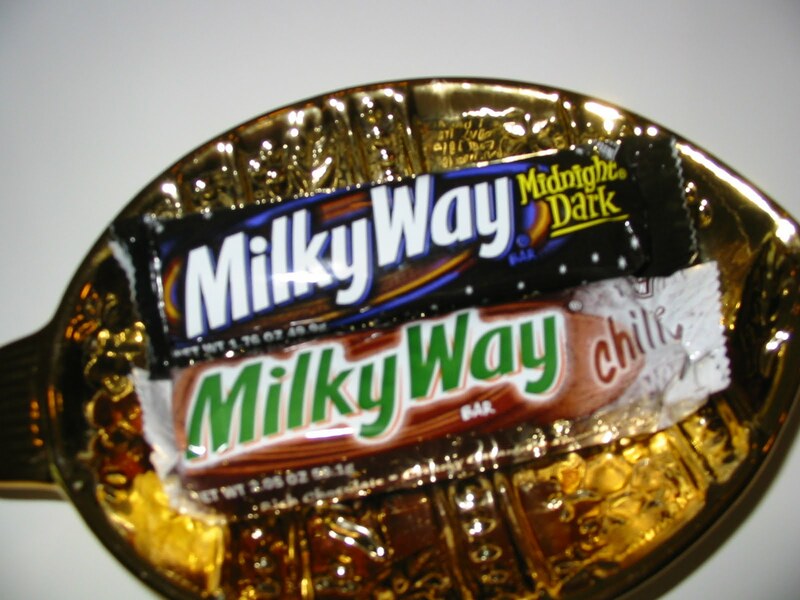 How many of you have had the Milky Way Midnight Dark variation that came out a few years back just as the hype about darker chocolate being healthier was beginning? I've had one a while back but I found these on sale, two for the price of one, at my local Kroger and decided it was time to do another comparison of the dark versus milk chocolate candy bar reviews. First thing to note is that these bars are not the same size. The Milky Way is 2.05 oz versus the Midnight Dark's 1.76 oz. So the nutritional information on the darker variety better have fewer calories, saturated fat and other differences simply because of size difference. Also remember that these bars will cost you the same but you are getting less, about 15% less candy for the dark version. The regular has 40 more calories, 1g more saturated fat, 20mg more sodium, 5g more sugars, 1g more protein, 3X the calcium but no iron. Out of all of that difference, the only honest one I see that can reflect the dark versus milk and not the size difference is the iron and calcium content. Aside from semi-sweet versus milk chocolate as the first ingredient on the appropriate label, the ingredients are identical. If it get this because it is healthier, it must be because the bar is smaller which you can't see in the photo above, can you? Difference between shape and weight though in the next photo you can see the darker variety is shorter. So if you aren't buying it for the health, what about the tastes? We'll start with the regular Milk Way. The outer coating is thick and snaps when I bite into it and it tastes chocolate, not like cocoa and wax. 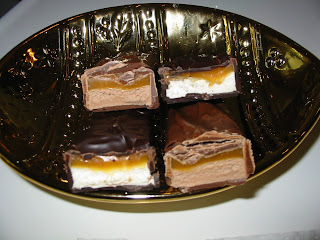 The nougat is creamy and fluffy while the caramel is a bit sticky and sweetly tart. Just what I expect from this candy bar. The Midnight Dark version looks different as you can see inside and out. The white nougat sets off the darker color of the coating but it also saps some of the darker chocolate's scent for some odd reason but the cocoa scent is pretty strong still. Midnight Dark is softer to bite into and very squishy to chew. The nougat is vanilla tasting and not as fluffy which makes the caramel seem more tangy but the dark chocolate has a nice bitter essence to it. I think given the two I personally like the darker version. I just have to remind myself that a slightly smaller candy bar is still a candy bar and I'm not wasting my money if it's on sale and I have it rarely as a treat in place of the regular Milk Way. Who has not heard of the actor Paul Newman? Anyone reading this not heard of this? Before his passing away in September 2008, he had more than 80 credits as an actor but also worked as a writer, director and producer plus over 30 awards as testament to his skill. 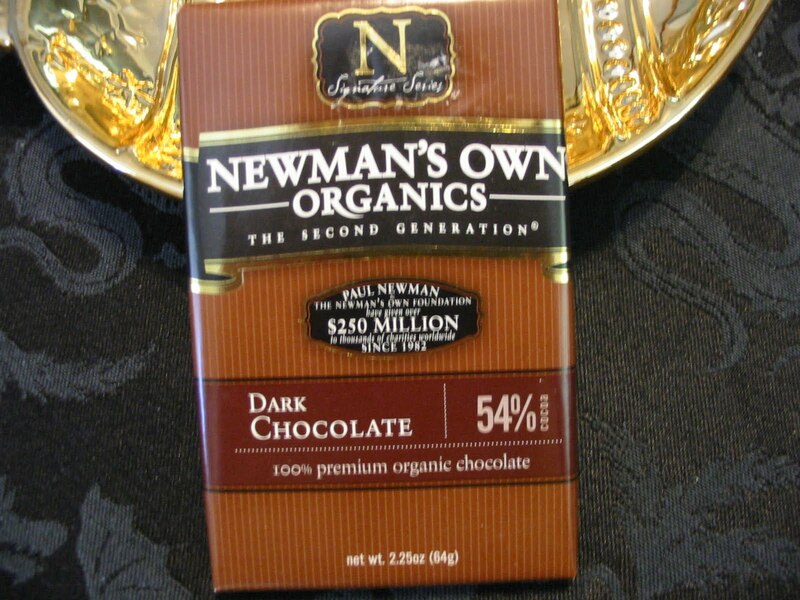 But he and his daughter also started a food company called Newman's Own which specialized in organic foods and donations to charity at the beginning of this movement to be natural and give back to the community. Your Chocolate Priestess bought this 54% dark chocolate bar at our local Kroger's a while back when it was on deep sale. Today I want to review it for you all. 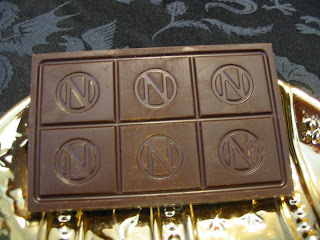 This 2.25oz bar is 4.25 X 2.75 X 0.25 inches etched into 6 fairly equal section but one bar is one serving. That serving has 200 calories, 13g saturated fat, 5mg sodium, 4g fiber, 28g sugars, 3g protein, 2% calcium and 10% iron. In terms of how much I see, this is pretty darned good nutritionally. At 54% cocoa content we are skirting the edge of what various scientific studies suggest is the health benefit threshold of 60% for all those wonderful things we know cocoa can offer some of us in moderation. The sections of the bar break apart far more easily than I expected given the unetched border surrounding them. It has an intense dark cocoa scent when I life a section and take a whiff of it. 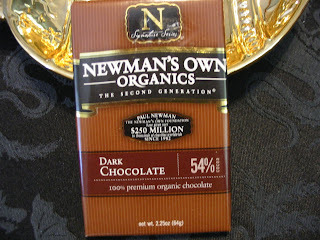 The label says it is certified organic and made with "Rainforest Alliance Certified" cocoa. Additional ingredients does include soy lecithin, can juice and vanilla but no dairy so I believe this is also then vegan. It has a strong, bitter cocoa taste countered by the vanilla but not creamy in the slightest. It melts slowly in my mouth and provides a slight buzz after one section. An excellent chocolate bar which goes beyond my expectations for whatI find in grocery stores and mass retailers. Now, it is a bit pricey but some times with chocolate price does equal quality. Look for it on sale, check out their website for coupon, or simply know that some of that money will go to charities but do try this once. I will contact her today if their email works. 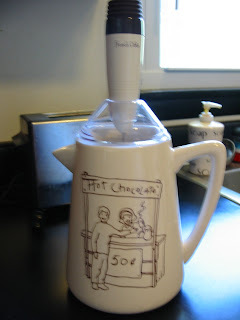 If an email is not available I will randomly draw another winner and contact them until I can find someone to send this hot chocolate maker to. 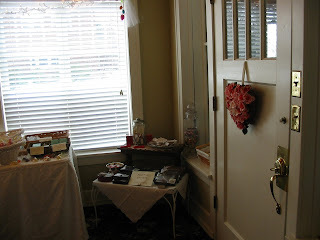 While on a trip recently, your Chocolate Priestess was on the lookout for chocolate shops and chocolatiers, and she found a lot of nothing, frankly, but that's for another post. 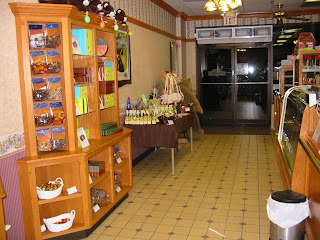 I did find a nice big candy shop in downtown Cedar Rapids Iowa called Simply Divine and went in for a visit. 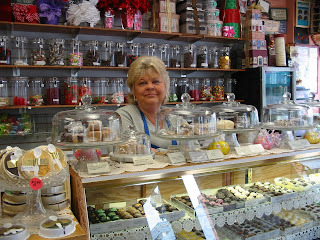 "Pete," the shop owner, is a very vibrant lady who gave me some of their fudge to try, so I'll be revealing that to you all today. In a regular review I'll be sharing their truffle collection with you all as well. 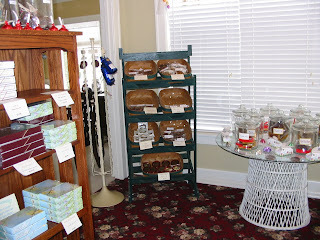 "Pete" shared four types of the fudge they sell at the shop and on their website. Since these photos were taken "on the road," you may notice variations in quality not normal for The Chocolate Cult. First up was a Snickers variety. This has four layers to it. 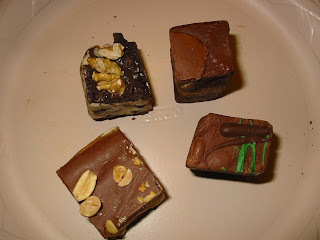 The bottom and top are a milk chocolate fudge with peanuts on the top. 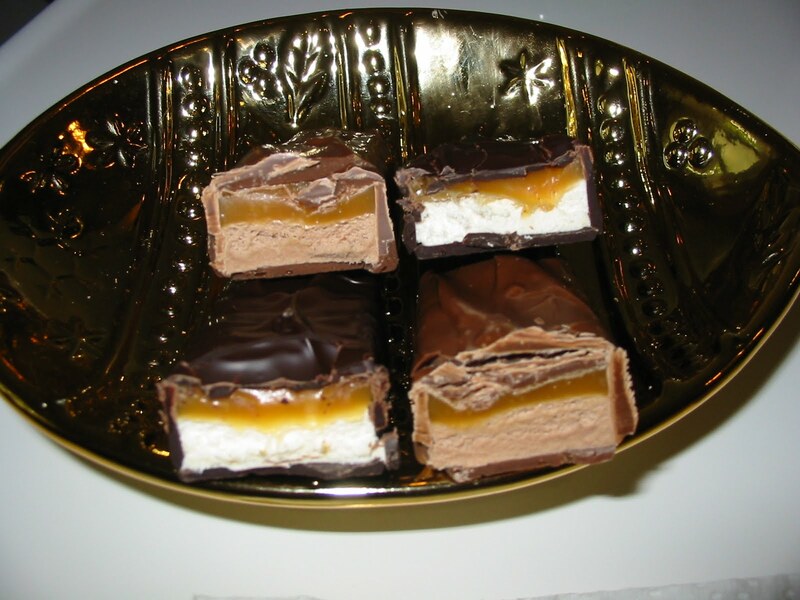 The lower middle layer is a sort of vanilla nougat style of fudge with peanuts mixed right into it, but on top of that is the fourth layer, made of caramel. Cutting a small piece reveals interesting differences in the textures, with very soft nougat but the peanuts, of course, hard and unyielding. The different flavors all combine to make a "Snicker" that is actually better than the candy bar this is named for. The caramel is sweet, the nougat tangy, and the chocolate creamy and slightly bitter with a nutty crunch. Excellent. 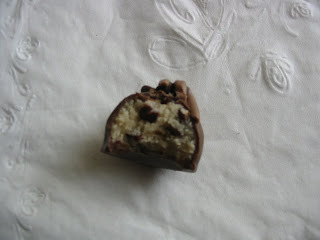 Second is a "Cookie Dough" variety that has visible pieces of chocolate chips and cookie dough in the bulk of the fudge, which has a vanilla fudge center. This is topped and rests on two darker chocolate shells with walnuts also on the top. These top and bottom shells make it impossible to slice off a piece, so I just bite off a corner and am immediately eating walnut chocolate chip cookie dough that tastes just like what I'd expect if I was making these cookies at home. Since I can't share this with the Milk Chocolate Acolyte, who has a nut allergy, and I doubt anyone else on our trip will want to share my germs, I'm forced to eat the entire thing for you all. You need to try this, Sisters and Brothers; you really, really do. Third was this "Peanut Butter Cup" type of fudge, which is huge and has three tiers. The top and bottom are a chocolate layer, but the top has two actual peanut butter cups in it as well; the middle tier is peanut butter fudge, which makes this a difficult piece to take just a sliver from to sample for you all. The peanut butter layer is creamy and soft, the bottom chocolate layer is milk chocolate and sweet, and the top layer has the interesting but slightly dry peanut butter cups. The result is a huge bite that I think must make any chocolate and peanut butter lover very happy. Finally a "Bailey's Irish Cream" flavor that's good year-round, not just in March. This piece of chocolate fudge has a green and chocolate crosshatch of lines across the top. It has a cocoa and sweet smell, but also a hint of Bailey's as well. Taking a sliver of it, I find it slices easily. It has a smooth, creamy taste and texture and melts quickly in my mouth. The cocoa is overwhelmed by the Bailey's in a short amount of time, and like all fudge it is very sweet. 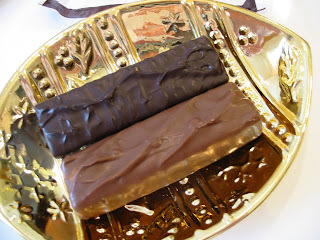 A nice twist on plain chocolate fudge that you should savor unless you want a nasty sugar rush from eating it too fast. If this looks like the fudge for you, check out Simply Divine. 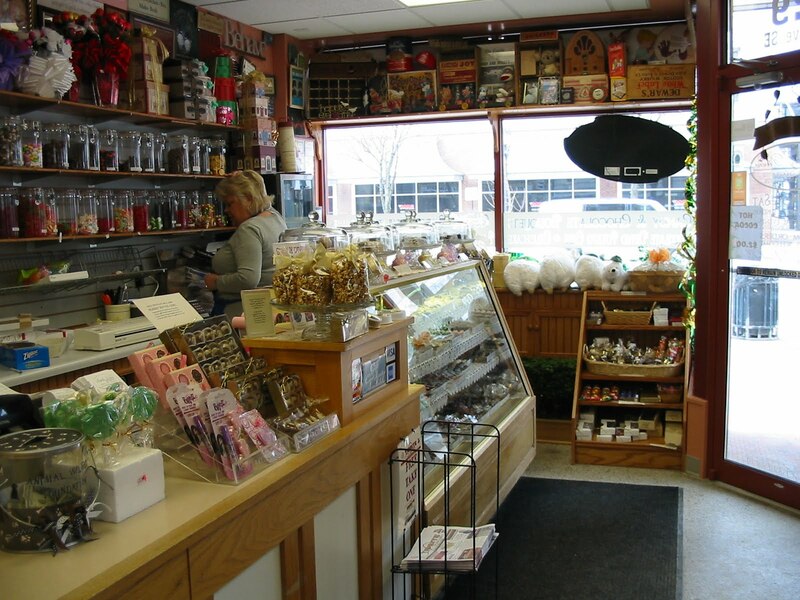 They have a lot of other varieties of candy, including a full array of truffles that they sell directly to customers and to local restaurants as well. "Pete" tells me they are the largest candy shop for 400 miles around unless you go to Chicago. 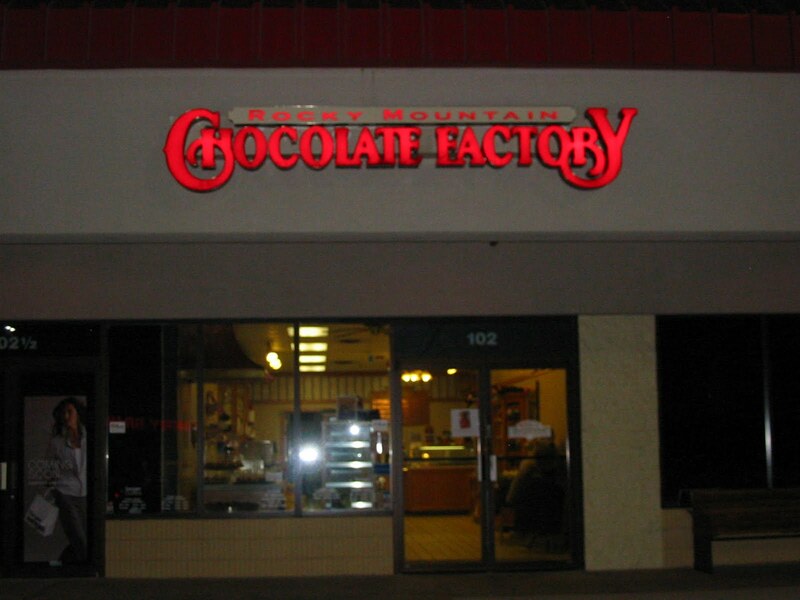 While I found 7 chocolate shops along that trip, there are long stretches of miles where I found nothing at all, so when you see one, stop and thank them for being there and helping you enjoy the Sacred Substance. Don't forget to enter this month's contest HERE. Winner will be announced Sunday morning so you need to hurry. 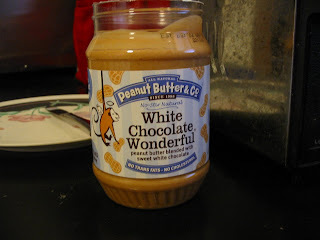 A few months back, I reviewed a dark chocolate and peanut butter spread from Peanut Butter & Co. Today I want to review the other chocolate and peanut butter spread I found in my local Kroger on sale one week: "White Chocolate, Wonderful" as it is called on the label. Does it live up to such a title? The first thing to note is that is doesn't spread as smoothly as the dark chocolate variety. It seems much drier but I put it on just toasted bread so that melted it and smoothed it out. 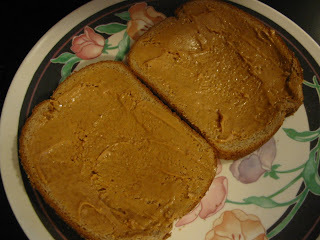 The second thing to note is that the spread has a very sweet, creamy smell, not very peanut buttery which is quite different as well from the dark variety. Inside this jar is only natural ingredients, no preservatives or artificial anything though there is added palm fruit oil and evaporated cane juice not just cocoa butter and peanuts. 2Tbsp is one serving of 180 calories containing 3g saturated fat, 35mg sodium, 1g fiber, 7g sugars, 6g protein, with 2% of both calcium and iron an adult needs daily. This is actually pretty darned good nutritionally, much better than I was expecting from a white chocolate product. But how does it taste? It tastes far more peanut butter than it smells but there is still that sweetness from the white chocolate. I think it could be a good balance for more sour fruit slices and a nice twist to peanut butter recipes. I have to say though that your Chocolate Priestess still prefers the dark chocolate version but this is very good too. 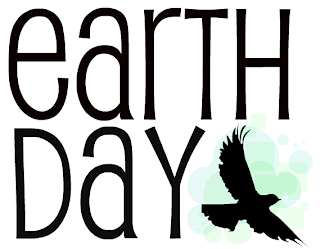 Today is the 40th anniversary of Earth Day which was supposed to make us all more aware of the harm human beings can do to the planet. As you know, Sisters and Brothers, I always mention when a company uses recycled materials, when they use chocolate and other ingredients that are produced through ecologically sounder methods, and if they support any charities through your purchases. But today I want you all to stop and think about the message of protecting the Earth. Is that really the best message to send? Honestly, the Earth is going to keep going until the sun burns it up or we blow it up in some way. The Earth's temperatures rising, the chemicals in the atmosphere changing, quakes and mass changes in the water and land divisions don't destroy the planet, only change it and change is constant in the universe. So when we say practice healthier farming, look out for your carbon waste, think about fair labor practices when you buy chocolate, we aren't saying this will protect the Earth because it will be here. We are saying this will protect us. We, human beings and the current life forms on this world, are what is at risk when we don't think before we do, when we don't think before we consume, when we just think of today and don't consider the effects of our actions years from now. Not thinking is selfish but being more mindful of what you eat and where it came from is selfish as well because it is looking out for you, your family, and your future generations. Don't forget to enter this month's contest HERE. Winner will be announced Sunday morning so you need to hurry. So today, buy some chocolate made in an ecologically sound fashion not for the Earth but for yourself and humanity's future. Today, Sisters and Brothers and folks just looking at The Chocolate Cult, we are reviewing a product and hosting a contest for you to win a copy of this exact product for your own use. 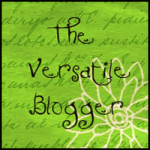 First the review and then I'll tell you how you can win your own hot chocolate maker. We use a lot of things in our homes ranging from barstools, to pillows, to cups, to clothing, to food. As foodie bloggers and readers we focus on food but unless you eat everything raw you have to prepare it in some fashion. A lot of the chocolate your Chocolate Priestess reveals to you requires no preparation but some of it including baked goods and hots drinks does require pots, pans, cups, plates and other ingredients. The folks from CSN Stores contacted me and asked if I'd do a promotion with them so I chose to look at the Bonjour 32oz French Cafe Hot Chocolate Maker that they offer through some of their stores. 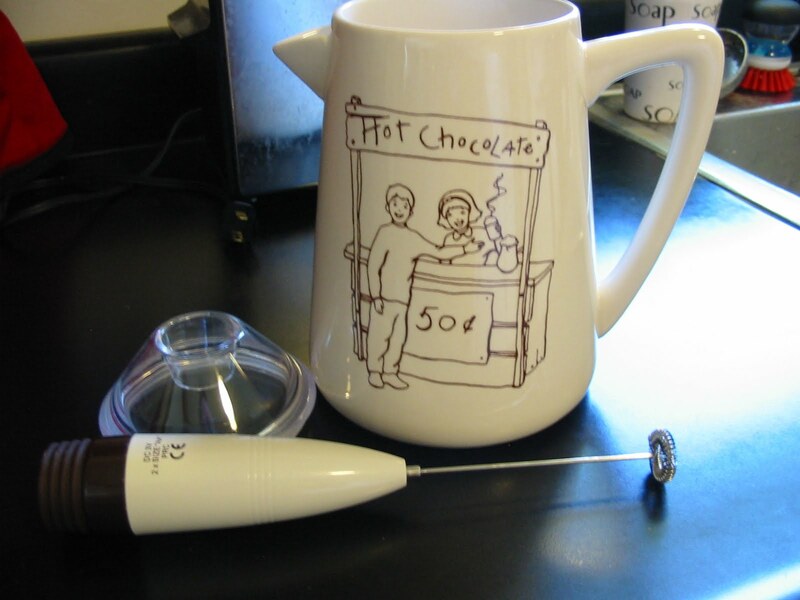 Inside the box are three individual parts to the maker including the pot which has a cute picture on it of a kid's hot chocolate stand, a lid, and a mixing unit or frothing device. The pot can be cleaned in the dishwasher, it goes in the microwave to be used, and comes out very cleanly. Be careful though because the handle gets hot, too. The lid can be easily rinsed off since it really doesn't come into contact with any liquid only steam. The mixing unit is more complex. It requires two AA batteries and it cannot be submerged to be washed ever so I used a brush and some soapy wash and rinsed off the rotating part to clean mine. It comes with a six panel booklet about the caring for it, using it and four recipes of which I tried out three -- one for white, one for milk and one for Mexican hot chocolate. The recipes don't describe what type of milk you should use but I used 1%. Do not go over the 4 cup amount or you will have too much liquid in the pot to work. The recipes didn't say how long to heat everything in the microwave so I strongly recommend you do it at a minute a time as you would to melt chocolate in it. While the booklet claims you can just mix it all with the mixing unit I found this to be untrue. Once the lid is on the mixer cannot reach the lower half of the pot and any chocolate and milk will not be mixed up no matter how many minutes you run it. I used a wooden spoon instead to mix it all during heat and before serving. The mixing unit is supposed to froth it all up and it didn't do that either. It does make about 32oz of hot chocolate which can serve 4-6 people depending on your mug size and everyone I served over three nights we tried it thought it was adorable and the hot chocolate tasted good. For cuteness and pouring, this was worth the $20 it costs but you must stir it and watch your timing when you heat up the ingredients. 1. 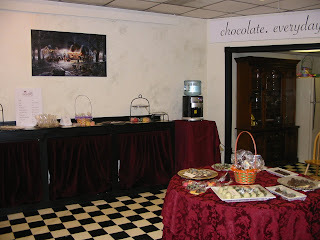 Join The Chocolate Cult -- you can become a Follower via blogger or follow us on Facebook or Networked Blogs. You can find links to all of these. 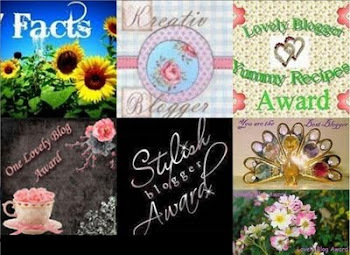 You must be a visible follower and I have to be able to contact you by direct email so watch your settings and double check them please if you are all ready a follower. 2. 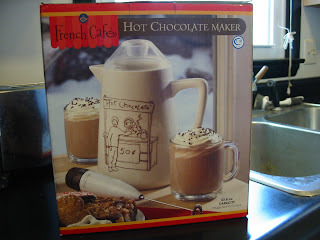 Leave a comment here explaining how you'd use this maker year around to enjoy hot chocolate. 3. You must be living in the USA or Canada for CSN to send you the Bonjour 32oz French Cafe Hot Chocolate Maker. Don't worry, I'll send you a private email to get your address and pass it on to them. I will not keep your address for my use nor make it available to anyone else. One contest winner will be selected using Random.org with each comment being assigned a number according to when it appears on the blog. I will make that decision on Sunday, April 25, 2010, by 9AM Eastern time so have your comments posted by then. 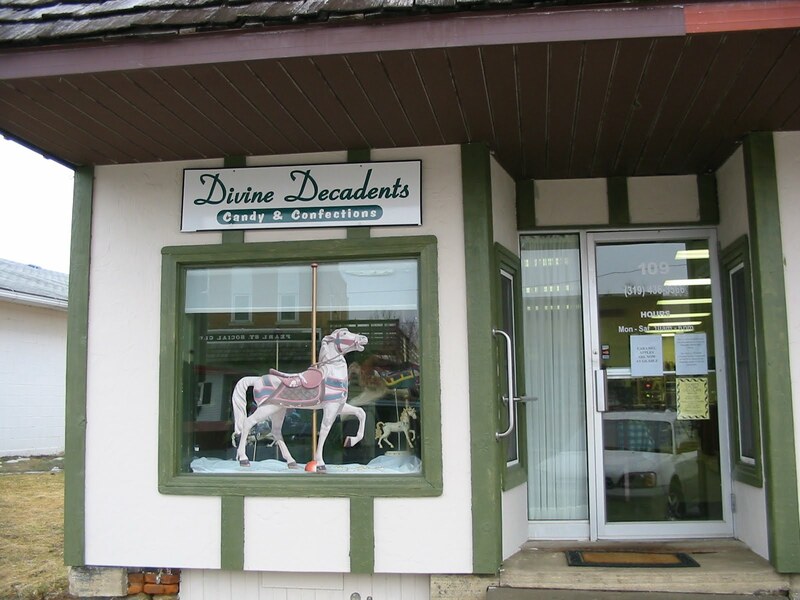 Divine Decadents in Shellsburg, Iowa, is a tiny chocolate shop, and they primarily work as a supplier to other chocolate shops and restaurants, but you can buy from them directly or stop in their store. 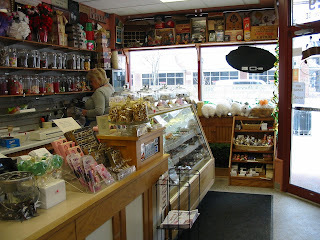 When I visited the store, I bought a few things, as I try to do when I physically visit a chocolatier, and they gave me some products as well. 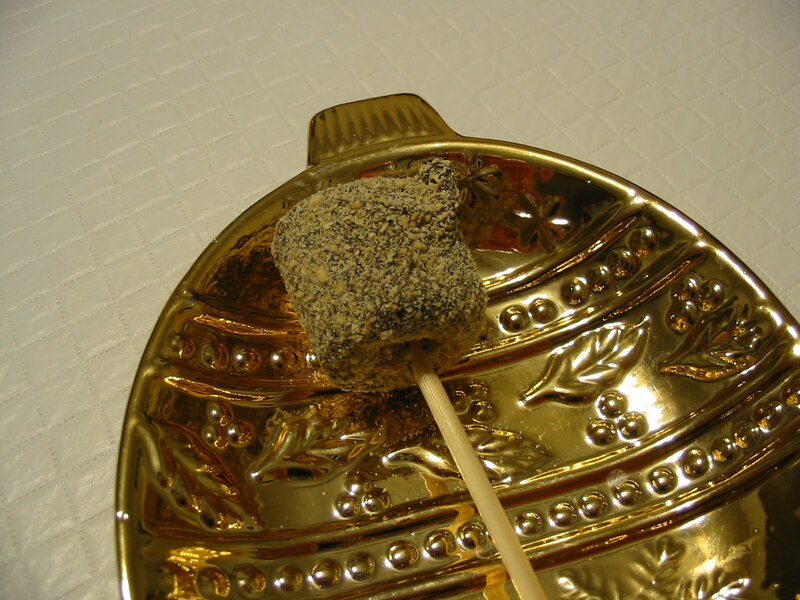 Sacraments, as you may know, Sisters and Brothers, are only for products we are sent or given to evaluate and reveal to you, so this essay is about the four truffles and a cereal treat we were given. 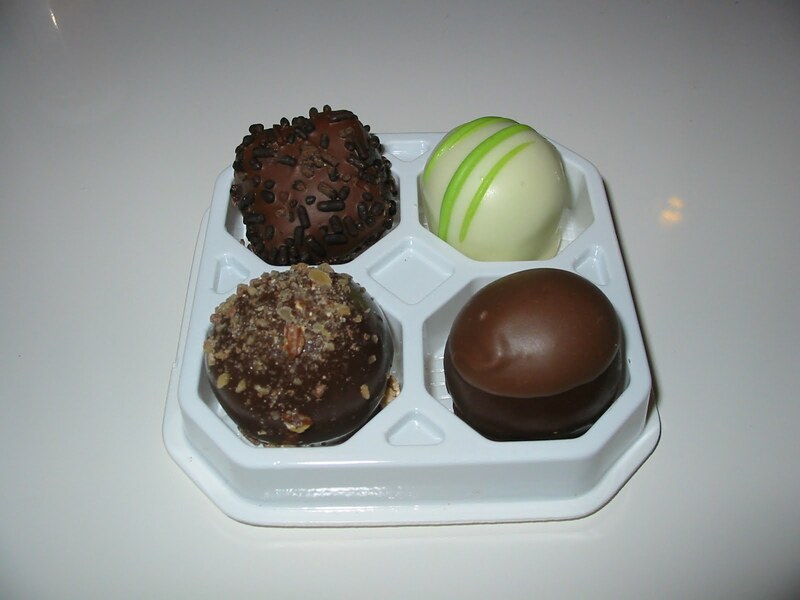 We'll reveal the truffles first, in the order shown in this photo to the right. I'm only going to show you the inside of one of these, because, again, I originally reviewed these while I was traveling and set this post up to appear later. The first piece is the "New York Cheesecake" of white chocolate with a graham cracker dusting on the top. It didn't really have a scent to it, but it bit open easily to reveal a very creamy cheesecake center that blended back into the white chocolate's creaminess perfectly. The result is just what you'd expect from cheesecake, so this was a perfect, tiny reproduction of that treat. The next piece, going clockwise is "Death by Chocolate," which is a dark chocolate shell with chocolate jimmies on the top. This had a very dark cocoa scent to it and again was easy to bite in half. Inside was a mostly solid cocoa center with a strong dark bitterness and a hint of vanilla, which created a slight burning sensation, which real vanilla can if you linger on it. Even half a truffle created a slight cocoa buzz. The "Chocolate Chip Cookie Dough" deserves to be the only cut-open photo so you can see the detail that Divine Decadents puts into each piece. Just look, and you can see the tiny chocolate chips and hopefully some of the doughy texture as well. The only scent initially was a light milk chocolate scent, and it was soft to bite into. Inside, though, was obviously cookie dough, and it has the grainy but creamy texture you'd get from eating cookie dough, including the crunchy little chips. It had a citrus sort of flavor as well to it, and the cream of the dough competed strongly with the chocolate, which I think was two types: a milk chocolate shell and semi-sweet chips. An excellent match to cookie dough, and the first time I've ever reviewed a truffle with this type of flavor. Finally, we try the "French Silk" piece, which has both a dusting of cocoa and a drizzle of lighter chocolate on top of the darker shell. These three types of chocolate played out in the scent, each one impacting my nose when I took a whiff. The center was smooth, as a French Silk pie should be. The dark and milk chocolate combined well, though a bitter bite was the final flavor in my mouth, which suited me just fine. They also gave me a dark chocolate-covered Rice Crispy treat on a stick -- I'm not sure it has another name. This has a dark cocoa and marshmallow scent, exactly as I'd expect. I've never made cereal bar treats on a stick before, so it takes a bit of thinking to decide how to eat it. I just bite off the upper right corner first. This makes a nice crunch with each chew, and the cereal inside is very sweet, as I know these sorts of treats should be. The dark chocolate shell adds an interesting flavor but doesn't manage to overcome the marshmallow flavor. 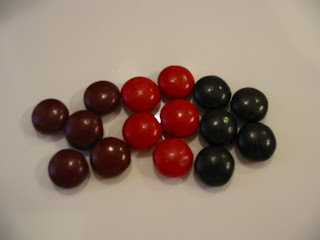 So if you like these sorts of cereal treats, love marshmallows and like a little bit of darker cocoa flavor, these are good tasting and fun to eat, though the last few bites will fall off the stick, so hold it over a plate, bowl or hand. Overall, the truffles from Divine Decadents were exactly as their names promised, and you sometimes do not get that with chocolates. I can see now why candy retailers and restaurants order these from eastern Iowa. The cereal treat was just fun to eat and made me think about trying such a thing in my own kitchen. If you want to check them out, for a limited time, until the end of April 2010, you can get free shipping on any order, so check them out soon. While up in Watertown, we happened to come across another local chocolatier making for two such shops in one South Dakato town. This one is wonderfully named Sweet Memories and is downtown on East Kemp. They don't currently have a website though the store owner, Randy H. Schliesman told me they are planning on creating one so you'll need to check out their Facebook page I've linked. Randy is a new chocolatier but he is going through all the proper certifications to become European trained so their business has great prospects I think. 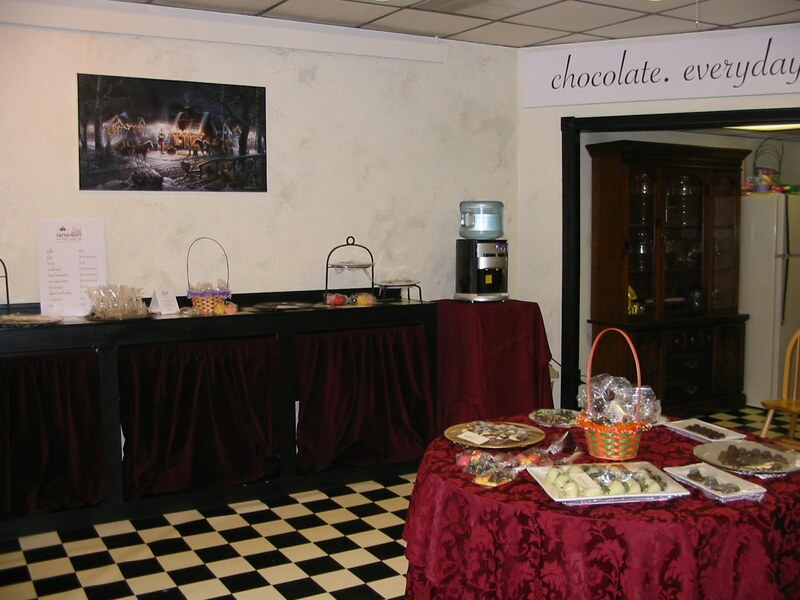 As with the other Watertown chocolatier, this store also offered us some samples we'll reveal in a later Saturday Sacrament. 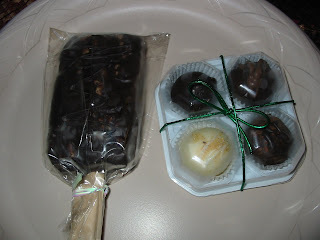 You'll see a trend in what I was able to buy at Sweet Memories on my budget for stopping by chocolatiers we found: Treats on a stick. 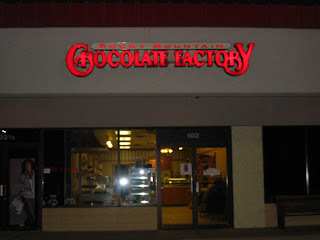 The Milk Chocolate Acolyte worried you all would think this was all they made but I assured him that I'd tell you otherwise plus you'll learn about their fudge and truffles during the Sacrament. I choose these four samples because they are unique, I had not seen their type of chocolate treat in any other shop I've visited and I know you all love variety, Sisters and Brothers. 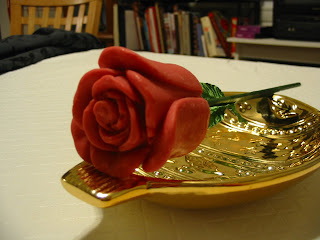 I want to start with this white chocolate rose. It came in a few colors but I really liked the red one and I hope my photo shows you the petals they've created. I mean created because clearly this was layered on by hand. It is heavy to hold and I really don't to bite into it but I know I must for you all. This smells like white chocolate and dye and triggers a concern. With white chocolate, almost any added flavor can easily become the most powerful essence in a candy or treat. Dye frankly does not taste good to me. I have to maneuver it around to bite off the top of one petal and keep it from cracking but I am glad I did because there is no dye flavor here, none, only creamy milk chocolate and I am very pleased by the taste. Next up was a seasonal treat that I still think can give us a taste for their molded white chocolates in general. 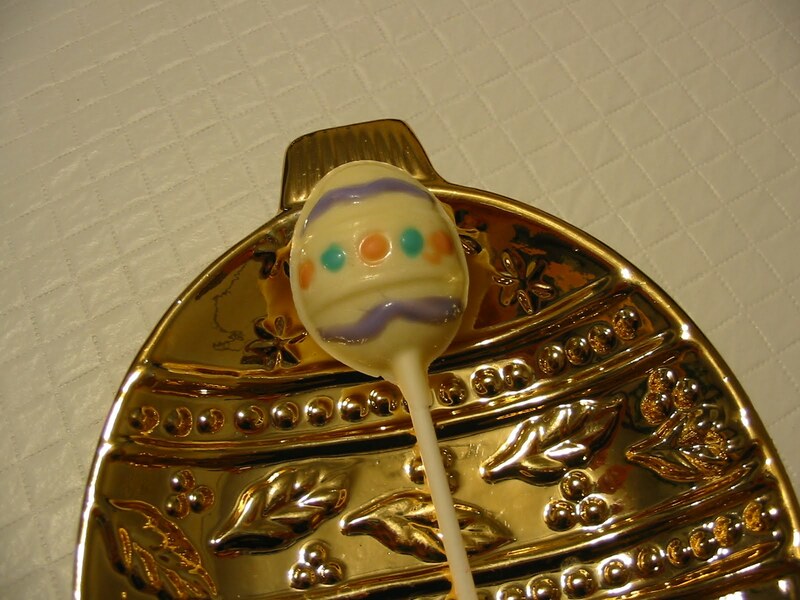 This Easter egg on a stick will hopefully be of the same quality as the rose though clearly it is more mass produced that the previous treat. It has a simple milk chocolate odor bite a bit of vanilla bite to it when I nibble off a section. Less creamy and more buttery in flavor than the rose was. Remember campfires and S'mores? 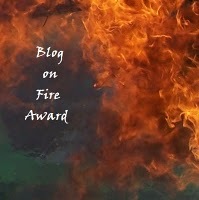 We've talked about "National S'mores Day" in the past and we'll mention that again in 2010. This marshmallow on a stick is sort like a S'more but let's see how thick the chocolate on it actually is under the graham cracker crumbs. The chocolate coating is just the right amount I think and the chocolate tastes a bit bitter meaning it is probably a darker variety. The sugar of the marshmallow and it's chewiness work well with the chocolate graham crackers so while not a perfect copy of a S'more it's a fun variation. Melt it a few seconds in the microwave to get a closer match or dunk it in hot chocolate. 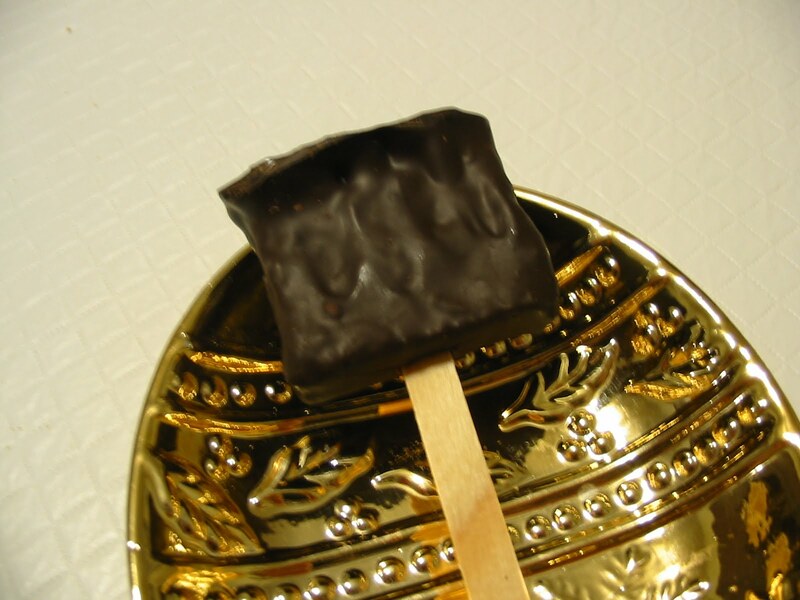 Finally we have a baked good on a stick and covered in dark chocolate. The brownie is very intense with a deep, bitter dark chocolate over it. Definitely has a cocoa kick to it. Instead of the super moist type of brownie that pulls apart like taffy I sometimes see, this is a more cakelike brownie which it would have to be for dunking in the chocolate coating. Collectively this dark chocolate coating over the brownie is almost chocolate overload. An interesting idea I might have to try and copy since I live two days drive from Watertown. These last two treats you'll want to eat within a few days for maximum freshness even though each treat was individually wrapped in plastic. 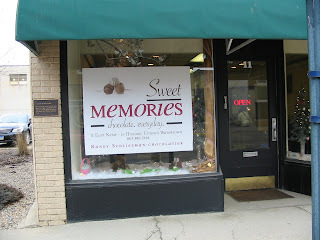 If these unique treats sound interesting to you and you are in the eastern part of South Dakota then Sweet Memories is worth finding. Hopefully they'll have a website soon, perhaps by the time we do a Saturday Sacrament in a few weeks or so. These are just two pictures of the store front that I took. I also could see their kitchen but the lady who helped me didn't want to be in a photo so I didn't take one of that area. 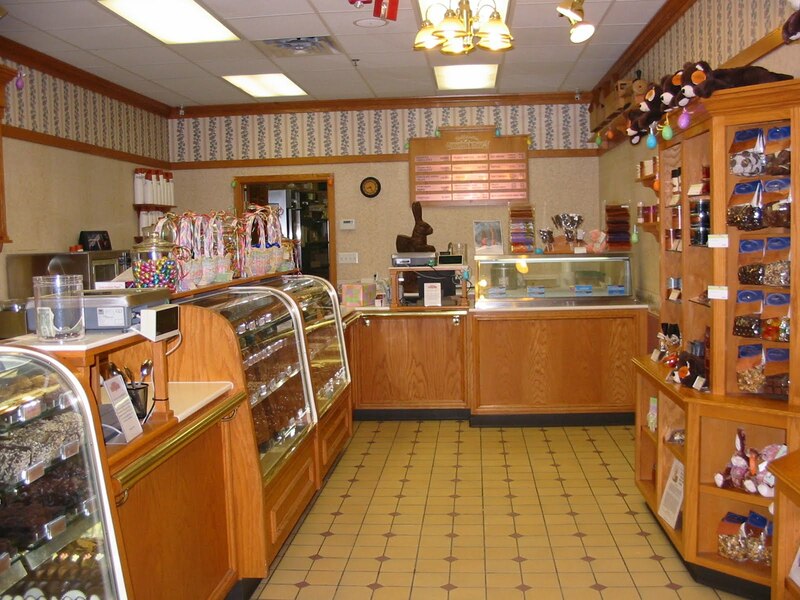 On our spring trip, we found some chocolate shops in Iowa but also in South Dakato where the Milk Chocolate Acolyte's parents, brother and grandma live. A friend of the Acolyte's owns a shop in his hometown and while they didn't have a chocolate shop of any type that we could find, he knew of one a bit north in Watertown aptly named Watertown Confectionery. So one morning we drove up and checked them out. 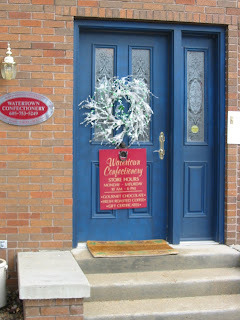 They were a bit difficult to find since they are housed in a private residence, their business entrance off to one side which isn't the street on their address. To the right you'll see that door. Once we found them, we discovered a very nice woman, Vickie, running the place. 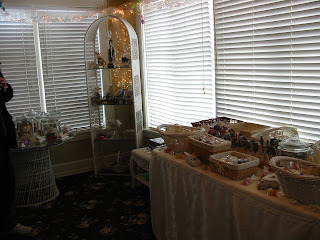 She told us that they had been in business for five years and were in the process of getting a space downtown which we'll reveal to you in the Saturday Sacrament we'll do in the future of the chocolates she offered to The Chocolate Cult. You'll note a spring or Easter coloration for many of these treats but since I bought them in March you shouldn't be surprised. I think they change the basic decorations on these types of treats to fit with the season. 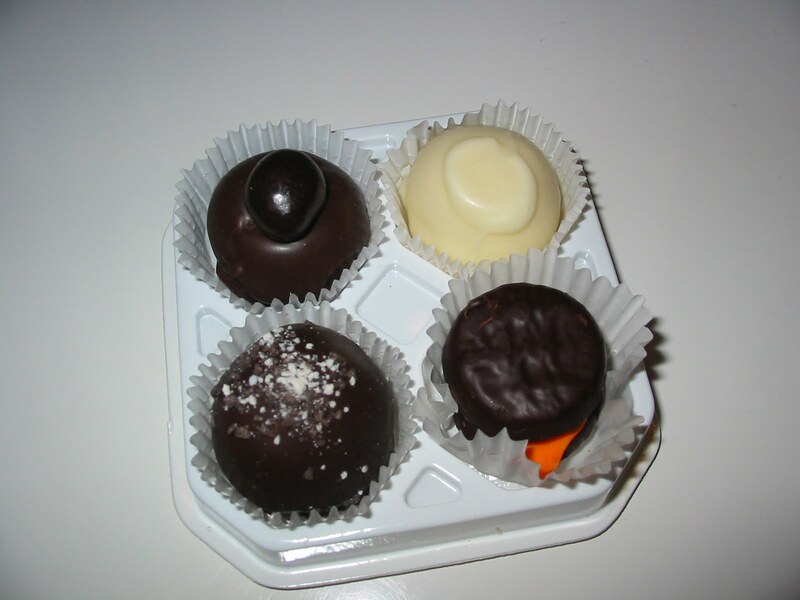 Staying within my budget, I was able to get 6 samples, including two white chocolates, three milk chocolates, and a dark chocolate to give you a good view of their variety. I'll look at each briefly in pairs. 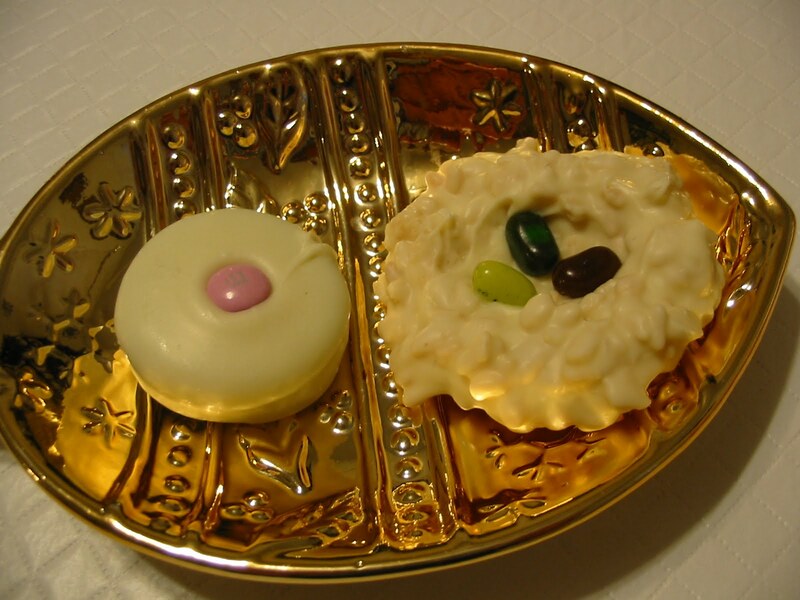 The white chocolate samples, and I confirmed these meet our criteria of white chocolate, Sisters and Brothers, can be found in several forms but I picked a white chocolate covered cookie and a "Bird's Nest" creation. I can tell the cookie is hand dipped because of the variations in coverage on the bottom, top and sides, but over all it is generously covered and smells very white chocolate. The cookie inside is crunchy and exactly as I expect for such a treat minus the waxy flavor you'd get if you bought something in a grocery store. The "Bird's Nest" is over 3 inches diameter of crispy rice with white chocolate and gourmet jelly beans and it looks much like the name suggests it should. Again this is a superior version of something your mom might have made for a kid friendly treat and very much worth the price. Different types of patties or what I'd call flat no bake cookies and candies could be found throughout the store. I bought a "Dessert Pizza" and a "English Toffee Crunch Patty". These are basically the same size as the "Bird's Nest" but in milk chocolate. the "Dessert Pizza" has crispy rice, milk chocolate, colorful jimmies and M&Ms. It crunches and tastes very chocolaty with every bite. The other treat is very buttery and chewy pieces of toffee covered in what tastes like a lower cocoa content milk chocolate which lets the toffee's tanginess become the final and most powerful taste. Finally I purchased two more novelty items. One is the milk chocolate bunny to give us an idea of how they do molded chocolates, and the other is a "Love Potion" or dark chocolate sample in a molded heart shape. The bunny is hefty and cutely detailed which I hope you can see in my photo. It measures 2.5 inches long, just over 1.5 inches at it's widest and rises about an inch and a half again. I bite the little bunny's tail off to cause him the least amount of pain and it melts in my mouth. It has a strong hint of vanilla and a good creamy milk chocolate taste that puts this into the higher category of molded chocolates. The "Love Potion" heart is 1.25 inches at it's widest and about 0.5 inches tall. The hook with the heart is that on the back of the packages are directions to eat it an hour before sensual activity so a nice gift to someone you love on your special day I think. The heart has a very strong dark cocoa scent and it melts on my fingertips. It has a crunchy texture and a very strong chocolate buzz so indeed eat it and wait for the sparks to wear off before you do anything else, please. Watertown Confectionery will be moving in mid May to their new downtown location. For now you can order on the website or visit their residential shop which I've shown you a few photos of during this review. We'll do our Sacrament on their official opening currently scheduled for May 15, 2010, to the general public so check back then. 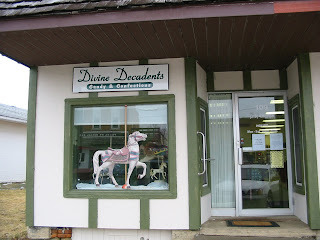 Simply Divine in downtown Cedar Rapids was another chocolate or candy shop your Chocolate Priestess visited during her spring trip through parts of the Midwest. I was so disappointed by the lack of any chocolate shops all across Illinois on 74 and from the eastern edge of Iowa to my hometown of Vinton that I frankly bought too many of these -- the lady, Pete, who owns the store and helped me out saying these were the most popular items in their store. She packed these in a box and then wrote out the flavors in their order so I could better review them. This review is late because it took me several weeks to try these in a moderate fashion. Our first group of four truffles we'll look at clockwise starting from the upper right hand corner of the photo to the right includes two cheesecake varieties and two alcohol inspired flavors. "Blueberry Cheesecake" is two toned in color -- a light purple on top with a darker chocolate on the bottom both covered with white drizzle. It has a medium blueberry scent to it. The fairly solid chocolate center has pieces of berries in it but isn't very creamy like I'd expect cheesecake to be. The pink with sugar pearls on top is "Pink Champagne" and has a strong creamy fragrance. The semi-soft pink center has a sort of fruity flavor but no alcoholic sting to it, mostly white chocolate creaminess. The medium chocolate covered in reddish drizzle is the "Cherry Cheesecake" but it has a primarily creamy scent that is unexpected. 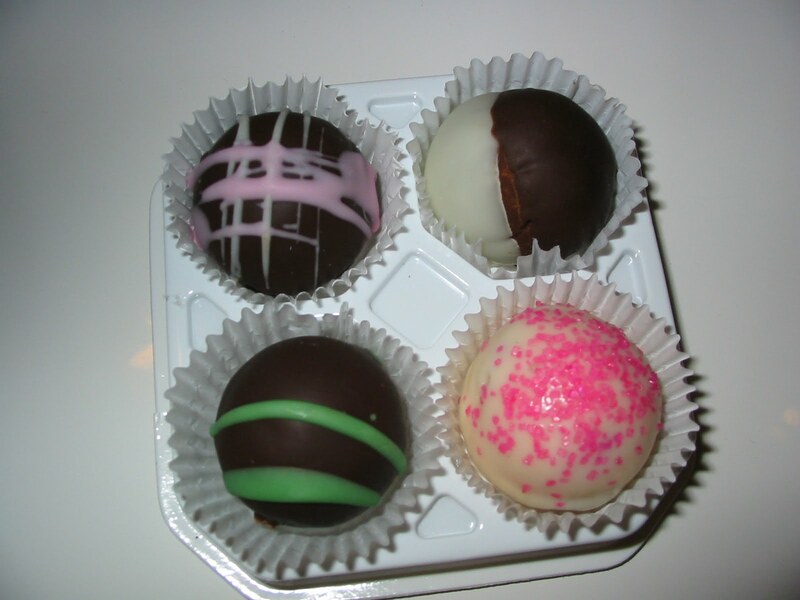 The center is light pink and chewy with a nice cherry and cream balance of flavors but not much chocolate essence. 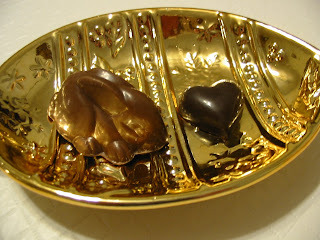 The "Amaretto" piece has a huge almond on top of a milk chocolate shell so it is easy to identify. The semi-soft center is also milk chocolate and has a amaretto flavor to match it's scent. 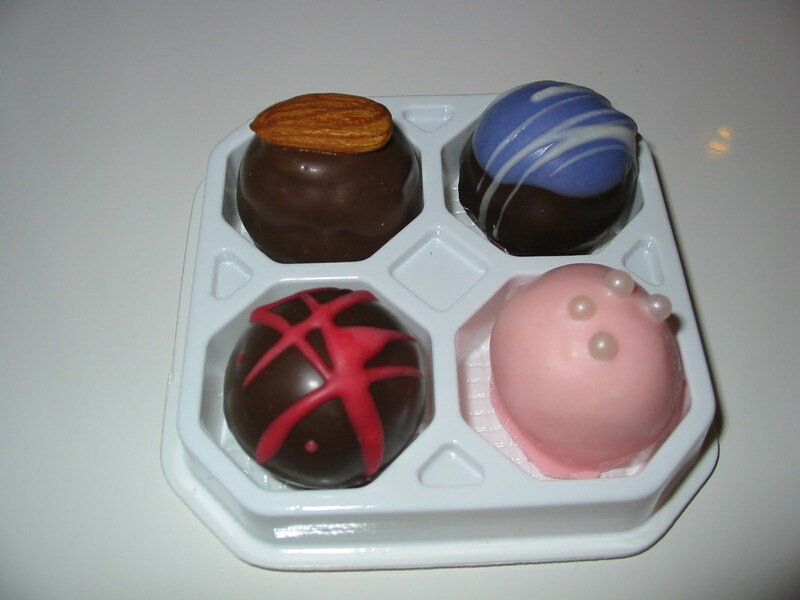 The second set of four truffles, in the same order, clockwise from upper right hand side, has a pie, nut, candy, and fudge variation of truffles. The "Key Lime" has a lime and cream scent. The pale green center has a milk lime flavor however, much lighter than the fragrance suggested though it builds up with each chew. 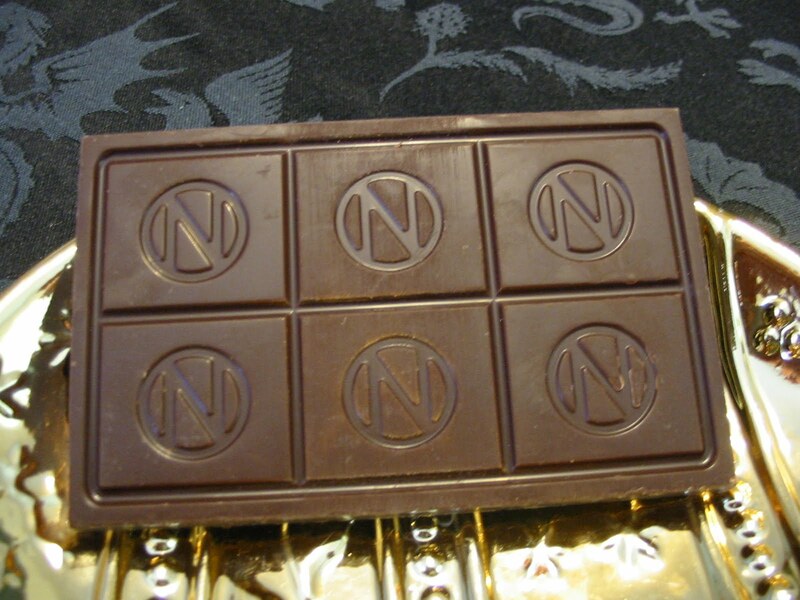 The "Hazelnut" is two tones -- milk chocolate on dark -- with an appropriate odor. Inside the firm center are pieces of hazelnut and a good balance of chocolate and nuttiness. Oddly the "English Toffee" has no scent at all but it does have pieces of toffee on top. 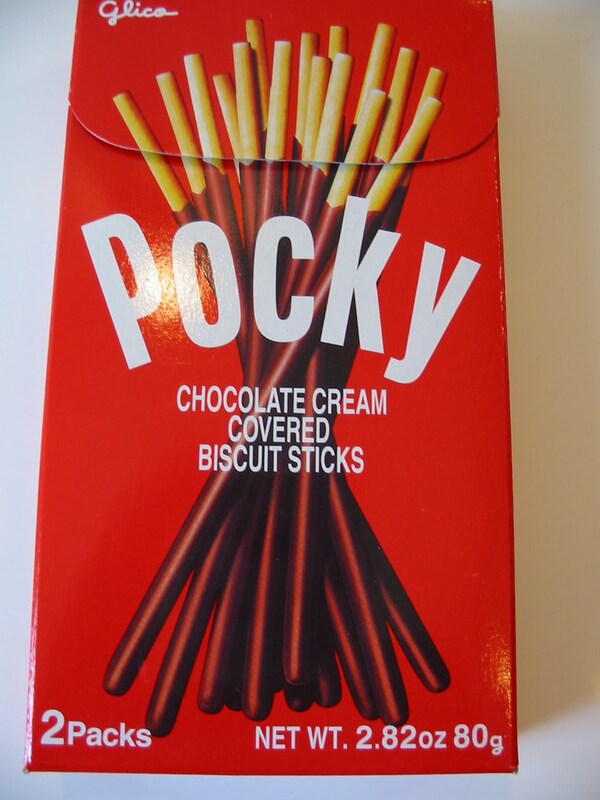 It has a light toffee taste but mostly milk chocolate is the principle flavor in the semi-solid center. Finally the only square truffle I bought was this "Fudge Supreme" which is covered in chocolate jimmies. 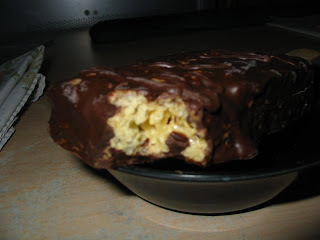 It has a light chocolate scent but a solid, flaky center that does have the creamy and butter heaviness of fudge. A common Midwest flavor begins our next set of four truffles followed by another pie flavor, a coffee take off, and another alcoholic inspiration. "Peanut Butter Buckeye" has the solid peanut butter center peeking out from the top of the milk chocolate. 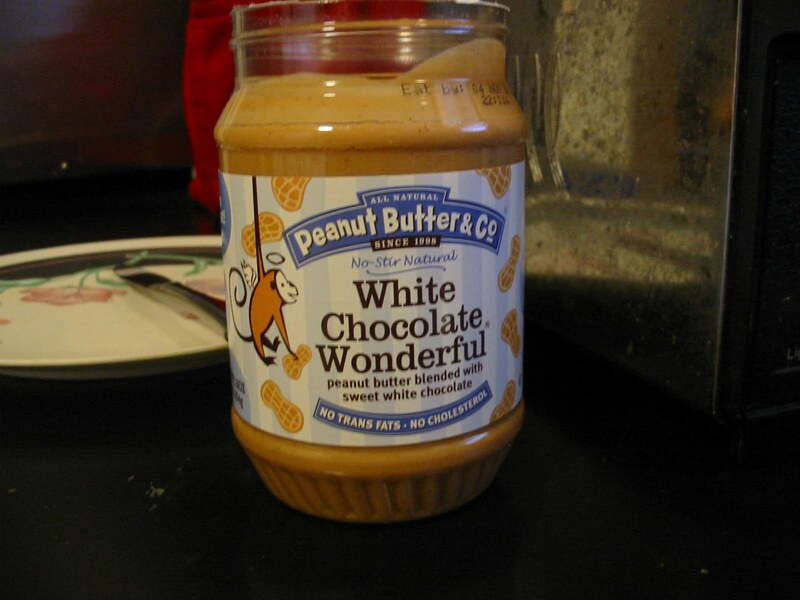 This has almost no scent and oddly the peanut butter is almost tasteless with zero chocolate flavor -- very disappointing really for something I grew up eating homemade versions of several times a year. The white chocolate practically dunked in yellow sugar crystals has a nice lemon scent as well it should for "Lemon Chiffon" another pie flavor. The solid creamy center has only a hint of lemon so probably not the best choice for lemon lovers. "French Vanilla Cappucino" is a darker chocolate covered with beige and white drizzle in an almost cross hatch pattern. It has a coffee fragrance and matching creamy taste that should be pleasing to cappucino lovers with a nice bitter chocolate aftertaste. the last piece is "Pina Colada" which is a dark shell with thick yellow drizzle over the top. 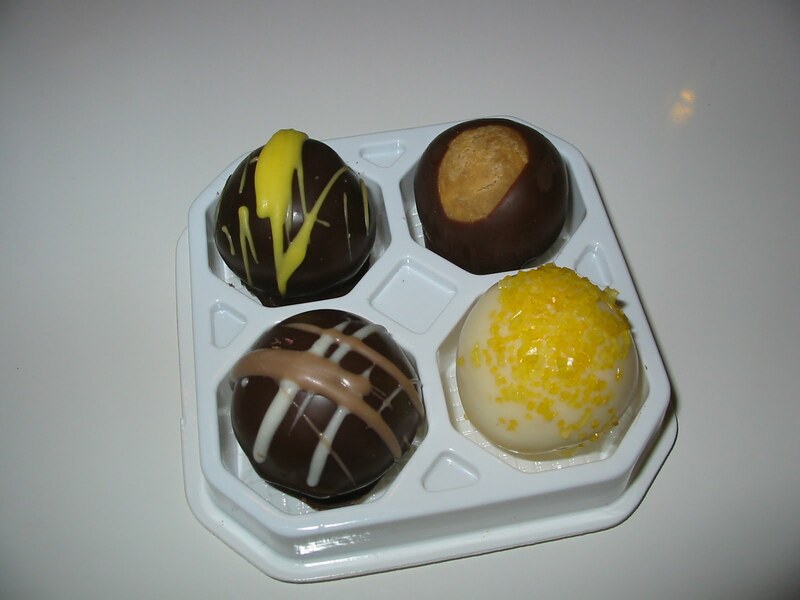 The off-white semi-soft center has a light pineapple flavor but little of the dark chocolate makes it through the creaminess of the truffle itself. The next group of four truffles I want to review includes a white chocolate and three darker varieties. 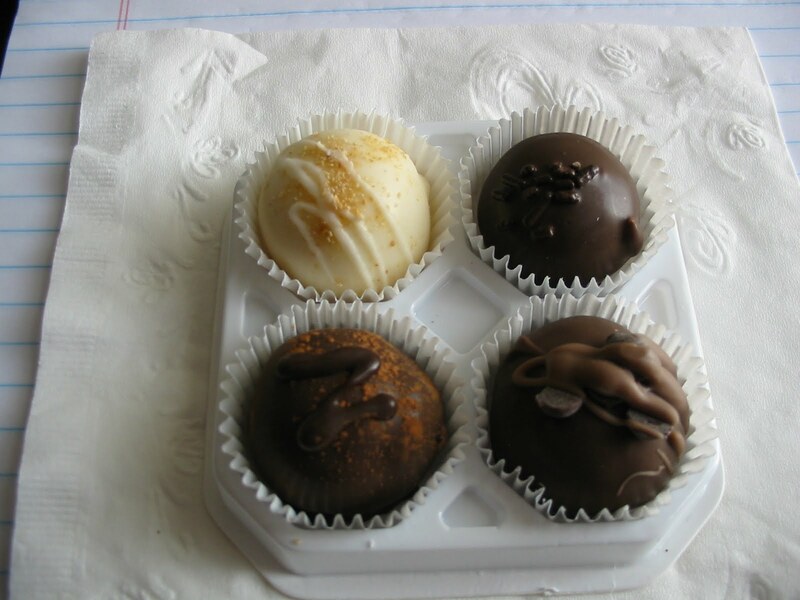 As before, I'll start in the upper right hand side and go clockwise around this quad of truffles. The "White Triple Truffle" has an almost overwhelming cream fragrance and is a white shell with a splash of more white chocolate on the top. Inside is more white chocolate in a semi-solid center that makes this a white chocolate lover's delight. The next "Citrus Splash" is different looking in that is appears to be two dark chocolate cookies over a bright orange filling that turns out to be citrus flavored frosting. It has only a light dark chocolate scent until I bite it to find these are not cookies but two flatter citrus filled truffles with a strong burst of citrus that almost overwhelms the cocoa essence. "Cookies and Cream" has flecks of cookies and what is probably the cream filling of many cookies over the top. This has an Oreo cookie sort of scent when I take in a deep whiff of it. Inside is a clear center of a very creamy tasting truffle but not a lot of chocolate and only a slight crunch from tiny cookies pieces in this center. Finally in this foursome we get to the "Expresso Bean" which I just honestly don't have time to get to our Mocha Acolyte. It has a definite coffee scent to me and is topped by a chocolate covered coffee bean. For me this has a solid coffee flavor tempered by chocolate and the result is a nice blend of the two tastes. The last group of truffles I bought at Simply Divine is this set which has two raspberry flavors. I'm going to review these four flavors in the same pattern -- upper right hand then clockwise. The first one is "Tuxedo" because it has a white and dark chocolate coating on one half of it. Overall it has a very good chocolate scent with a hint of vanilla; the white side actually smells a bit like citrus. This is repeated in the flavors when I take a bite into the semi-solid truffle making it really two flavors in one. The "White Chocolate Raspberry" has pink sugar crystals on top and a strong raspberry scent. Inside the truffle is cream colored with pinkish and reddish flecks but no seeds. Raspberry is the principle flavor as well since the white chocolate is mostly a creamy taste. "Creme de Menthe" has the green stripes on it and very strong chocolate scent. It has a strong, bitter chocolate semi-solid center that changes to a cooling sensation as I chew. The flavors blend well and provide both the coolness of mint as well as the buzz of chocolate you'd want in such a flavor. Finally, the "Milk Chocolate Raspberry Cheesecake" has drizzles of white and pink. This has a lighter scent than the previous raspberry truffle but the flavor is very much cheesecake and really doesn't allow much of the milk chocolate coating out when I take a bite and chew. Four of the flavors of truffles they recommended to me at Simply Divine which I'll review on our Saturday Sacrament for April 17, 2010. 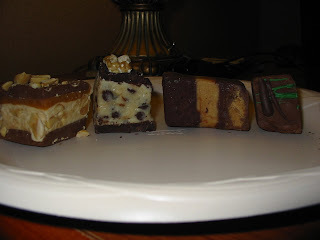 These are the "New York Cheesecake," the "Death by Chocolate," the "Chocolate Chip Cookie Dough" and the "French Silk". Why am I reviewing these then? 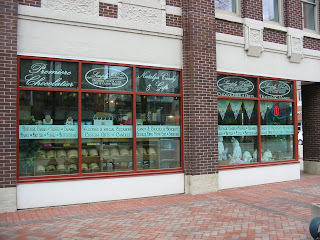 Because the truffles I bought at this Cedar Rapids store were made at Divine Decadents and they gave me those four samples thus earning a Sacrament. Ultimately these truffles ranged the gambit from excellent to average in flavor and the amount of chocolate the extra flavors allowed through. If you are ever in the store, Pete will be happy to help you as I witnessed with several other folks who came in. The photo to the left is just the front 1/4 of the store inside. If you want to check them out online they ship worldwide as well. But please, what ever you do, watch how much you purchase or store them well and eat them slowly. Too much of even the world's best truffles is still too much for you body and will dampen the wonderful effects we want from the Sacred Substance here in The Chocolate Cult. If you can remember, Sisters and Brothers, I bought a lot of different internal products for World Chocolate Day and International Chocolate day this past fall/winter. I promised I'd review them later and today is another of those reviews. 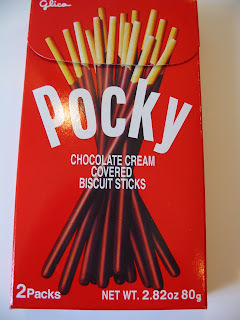 Have you hear of Pocky? 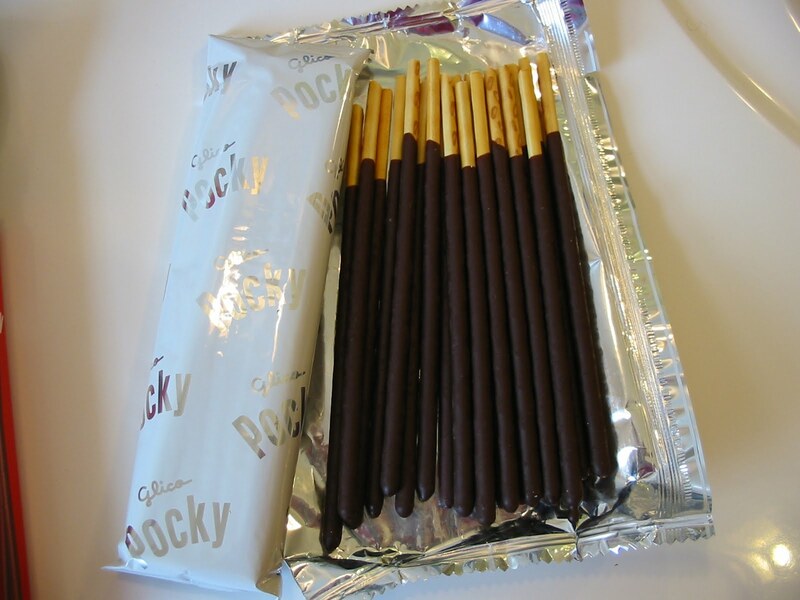 It's a Japanese treat which is basically a 5 inch long biscuit stick, like a thin bread stick almost, that is about 5/6 covered in some type of sweet coating. This version is chocolate but it also comes in a ton of other flavors including nut, fruit, and different types of chocolate. If you wanted to have a bit of a laugh and see what type you should try, check out this QUIZ. I found this just in our local Kroger in the International food section but I've also seen them in some Asian food stores and discount department stores as well. So far, I've only see the white, milk and dark chocolate varieties along with strawberry where I live but there are a lot more if you can find them. 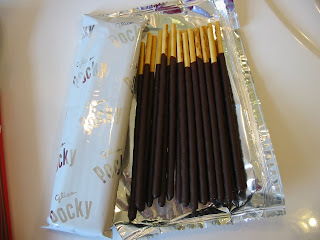 Inside the box are two envelops with the Pocky sticks inside. One packet equals one serving with 200 calories, 4.5g saturated fat, 5mg cholestrol, 80mg sodium, 1g fiber, 11g sugars, 4g protein, and 2% calcium. The amount of sugar was low compared to many candy bars of similar size. The sticks are easy to hold on the uncovered end though if it isn't too hot I eat them that end first just to be silly. 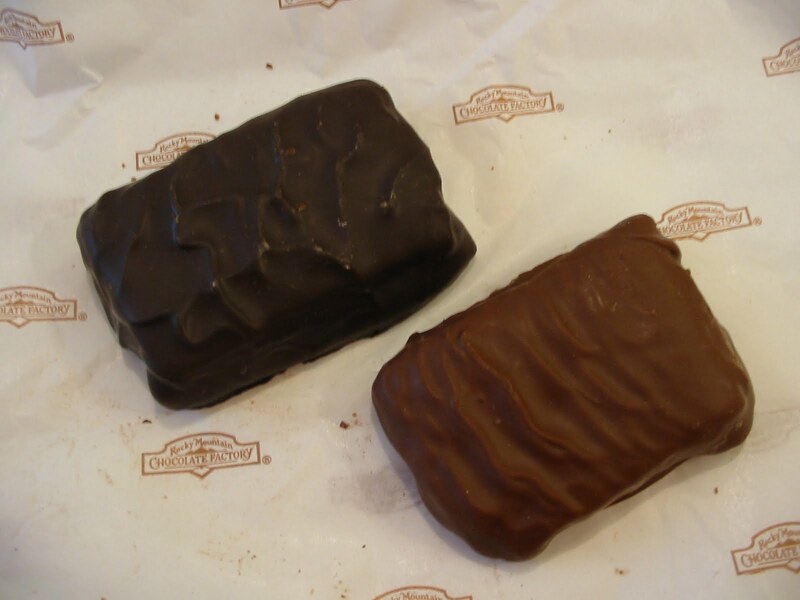 The chocolate is bitter, rather darker than what we expect in America when we see a title like "chocolate cream" on a treat. That makes me eager to try the "Men's" or darker variety of this in the future. There isn't enough chocolate here to really create a cocoa buzz it is a very fun treat to eat and share especially when you are watching anime though you can eat then whenever you like. This is a treat everyone in my house enjoys.